Aiken Electric Cooperative Sponsors Six Students for Trip to D.C.
By Edgefield Advertiser on July 15, 2013 Comments Off on Aiken Electric Cooperative Sponsors Six Students for Trip to D.C.
Ashley Axson, Joshua Cady, Erin Sweeney, Christian Carey, Chelsea Argroe and Destiny Ligons represented Aiken Electric Cooperative in June at the nation’s capital. Six local students were among more than 1,500 high school seniors visiting Washington, D.C., June 15 – 20 for the Rural Electric Youth Tour, sponsored by Aiken Electric Cooperative and hundreds of other electric cooperatives across the country. Chelsea Argroe, Wagener-Salley High School; Ashley Axson, Orangeburg Preparatory School; Joshua Cady, South Aiken High School; Christian Carey, South Aiken High School; Destiny Ligons, Ridge Spring-Monetta High School; and Erin Sweeny, Strom Thurmond High School were sponsored by Aiken Electric Co-op to attend the all-expenses-paid Washington Youth Tour. The students were selected on the basis of their academic achievements, school activities, community service and a personal interview. 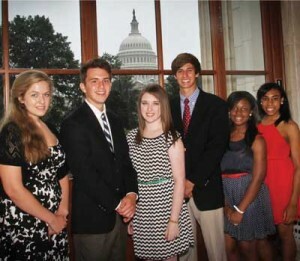 Each year, the entire national Youth Tour delegation descends upon Capitol Hill to meet their state representatives. The Aiken Electric Co-op students met U.S. Senators Lindsey Graham and Tim Scott as well as Rep. Joe Wilson, Rep. Jeff Duncan and Rep. James Clyburn. South Carolina’s electric cooperatives have sponsored the Washington Youth Tour since 1968. The trip is designed to educate students about our nation’s capital, the sacrifices made for our freedoms and the value of the cooperative way of business. The students return home with a greater appreciation of our nation’s leaders, a respect for the beauty of Washington, D.C. and friendships that will last a lifetime. In addition to receiving an educational travel opportunity, Youth Tour winners also are eligible to compete for a $2,500 college scholarship and a slot on the Youth Leadership Council, made up of one delegate from the 43 participating states. All high school juniors whose primary residence is served by Aiken Electric Cooperative are eligible to apply for the 2014 Youth Tour. Applications for the 2014 Youth Tour will be available in November at area high schools, on Aiken Electric’s website at www.aikenco-op.org, at Aiken Co-op offices or by calling (800) 922-1262. Aiken Electric, a Touchstone Energy cooperative, is consumer-owned, not-for-profit electric utility serving more than 45,000members in Aiken, Barnwell, Calhoun, Edgefield, Greenwood, Lexington, McCormick, Orangeburg and Saluda counties.